And those are the idealists! The pragmatists are more polite, but watch them closely and you'll often find amoral deal-making, cozying up to lobbyists, rampant vote buying, ignoring the Constitution, unjustified pork-barrel projects, and rigging the system to get reelected. And even when they do behave, we still have a problem: mere compromise is not enough. We have exploding deficits, chronic poverty, global warming, disappearing biodiversity, overflowing prisons, broken homes…We need more than half-measures. We could use some radical solutions. Progressive liberals who would bury us in bureaucracy in pursuit of equality. Deep environmentalists who would reduce us to vegan yogis to save the planet. Moral conservatives who would create a police state and fill our jails yet further in pursuit of order and morality. Radical libertarians who would abolish every government program, no matter how useful. Good business practices – from utopian socialists. Ways to reduce profits and increase wages – from Adam Smith. Effective environmental ideas – in Forbes Magazine. Ways to restore conservative community values – in Mother Jones. A case for repealing many victimless crime laws – in the Old Testament. Powerful ways to increase economic equality – in conspiracy literature. Effective welfare system ideas – in science fiction and the Old Testament. Welcome to the world of Holistic Politics, where we cross lines, invade echo chambers, relish irony and unearth forgotten solutions to many of the world’s problems. It starts with mastering multi-dimensional thinking. Most democracies divide into parties of the Left and Right, each advancing a set of values and deprecating the values of the other side. In between, we have moderates who help provide a mix of each, but such compromises are often ugly and inefficient. Opportunities are overlooked. While preferable to the first two spectra, this positive view overlooks history. Many extreme Left governments delivered big government without much equality: think Soviet Russia. Meanwhile the Right government of George W. Bush has delivered a widening wealth gap and bigger government. The trillion dollar annual subsidy to the super rich. How the tax code favors corporate mergers. How the government artificially raises the pay for professionals and managers at the expense of the working class. Cut the subsidies for the rich, and we might not need government provided welfare. But in case we still do, I also have a series of articles on the economics of effective welfare. In these days of growing population and fixed-size planet, the grand debate has shifted to preserving nature vs. prosperity. This is well and good up to a point. Environmental preservation does have a price, and many forms of consumption do hurt the environment. But go too far in either direction and self-contradiction results: a pristine environment is a form of wealth! Once we get past the crisis stage, further improvement to the environment is a luxury. An anti-luxury mentality is thus self-defeating. Many environmentalists try to circumvent this dilemma by magnifying environmental threats in order to stay in crisis mode. They cry “Wolf!” As a result, many non-environmentalists discount legitimate concerns. Not good. To get to the next level of environmentalism, we need to look in two dimensions. 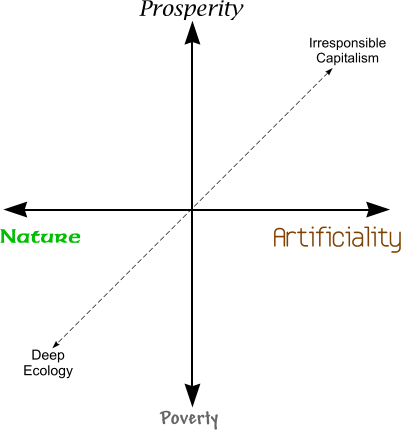 Excellence in environmental preservation requires that we either brainwash half the population into being nature worshippers, or we look for solutions in the upper left quadrant, at ways to boost prosperity while better preserving nature. The green menu items provide the latter options. For example, we can stop global warming while continuing to prosper. Conservatives take note: you can use the climate change issue as a convenient crisis to get rid of the income tax and get something resembling the Fair Tax! Many in the Religious Right call for harsh laws for immoral behavior. On the other side, liberals call for government endorsement of acts contrary to Biblical Law, and many Objectivists call for the outright renunciation of religion as the key to liberty. Some surprisingly libertarian components of Old Testament Law. Why imposing Christian standards of morality on the entire populace is an inherent contradiction. Why democratically elected government can never be a force for moral excellence. If you love freedom but find libertarianism to be too extreme and/or simplistic, you have come to the right place. Here you will find a much more palatable freedom vision, more practical and more utopian than standard brands of libertarianism. The very idea of Holistic Politics is in direct defiance of Murray Rothbard’s doctrine that all values should be subservient to cutting government. Ayn Rand’s greed based ethics is incompatible with a free society. Ayn Rand, Murray Rothbard and the other Austrian school praxeologists derive way too much from crude approximations of human nature. Murray Rothbard’s derivation of no-compromise anarchism is seriously flawed. Most schools of libertarianism start with an incomplete set of natural rights. Libertarianism does not maximize freedom; it ignores important aspects of freedom. The freedom vision on this site results in more freedom even though it allows for compromise. These are hard lessons, I know. It took me decades to learn them all. Rand and Rothbard wrote powerful prose, siren songs for those who inherently love liberty. I was beguiled myself for many years, but my love of debate kept me out of the echo chambers, and I slowly learned from my mistakes. In “What is Freedom?” we find that freedom has multiple aspects, including liberal, conservative and environmental components. The libertarian view of freedom is important, but incomplete. In “Really Natural Rights” we can derive an ethos to support freedom in its multiple aspects by asking what rights would we have in a state of nature; that is, what rights are provided by nature. Under the Synergy menu column you will find article series which impact all four values: liberty, equality, nature, and morality. In the new Tax Reform series we explore how to simplify the tax code, while making it more progressive, as well as compatible with nature, morality, and the Bill of Rights. For those who want to take action there is the Getting There series. 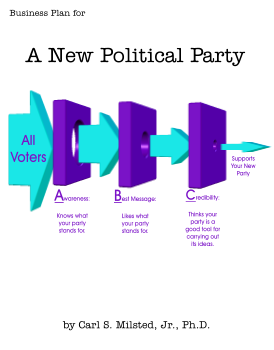 And for those really serious about putting [some of] these ideas into action, I have written a Manual for Starting a Political Party based on my quarter century of experience within the LP.